Poznanians have a sense of humor and they don’t take the stereotypes connected to them too seriously. They laugh at the jokes made about them. Our ability to laugh is so honest and integral to us that in 2008 the Town Hall ran a contest for the best joke about Poznan and Poznanians. Here are some of the entries which we found very funny. 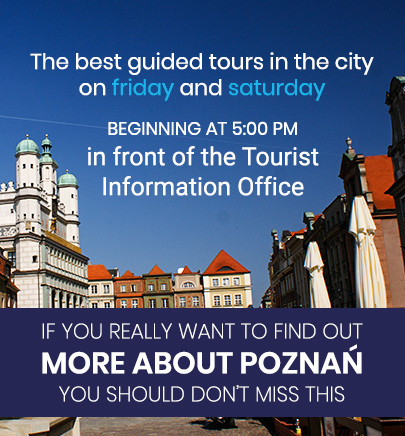 After a nuclear attack what will be left of Poznan? Why do Poznanians always pour tea to the very brim of the tea coup? So there’s no more place for sugar or lemon. – if you’re a good boy we’ll go the pastry shop and look at the ice cream. Three people meet: one from Warsaw, one from Cracow and one is a Poznanian. The first one bought half a litre of vodka for everyone to celebrate the meeting. The Poznanian had his mate come and pour the liquor. Three gentlemen meet at a restaurant, they are all owners of breweries. First one – the Okocim Brewery. Second one – the Tyskie Brewery. Third one –the LECH Brewery of Poznan. One Okocim please. – says the first one. One Tyskie please – says the second one. Coca Cola please – says the third one. Why are you ordering Coca Cola? What? If you’re not drinking real beer I’m not going to either. Father and son go on a trip to Warsaw. They rent a room in a hotel, the father is just unpacking the luggage while his son is looking around the room, when after a minute the hears his son shout: – Look Dad! There’s a bath tub here! Too bad, if this was Saturday we’d have taken a bath together. Two men are fighting about which one of them is more of a cheapskate, one from Cracow and one from Poznan. They agree on a bet. They’re going to go to a church to see how much either of them is going to put on the donation collection tray. The mass begins and the priest is approaching with the tray. Man from Cracow put down 1 grosz on the tray and gave the Poznanian a content look. The Poznanian returned the look and said: Father, that money was for the both of us. Welcome, lads! Here, take your seat. What’s your poison? Coming right up… that’ll be 40 groszy. Barkeep – why so cheap? Well, you see… This is how it is. I was a sailor years ago, I’ve always dreamed of having a place like this. I won 25 million dollars in a lottery, I returned to Poland, I bought the place, and because I like people I decided to sell cheap drinks. I don’t need to worry about making money because I already have it. I’m doing what I love and I get to meet some interesting people. What a wonderful story! Tell me, why have those three men been sitting in the corner for the past 40 minutes and they haven’t ordered a thing? Oh, them. They’re from Poznan and they’re waiting. Happy hour with 50% off starts at 6 PM. Beggars are boasting between each other about how much money they collected on Sunday. The one who was sitting by the church says “Sat there all day, I pulled off 50 zloty, a 50 I tell you.”. The second one who was sitting by the Dominican church says “right, and I got a 100!”. The third one says: “After four hours I had me a 300.”. The other are shocked: “What? How did you manage that? Tell us.” – “I had a card saying I’m collecting money to return to Warsaw”.